With anticipation for the 2010 FIFA World Cup building everywhere from ESPN to Vanity Fair magazine, it’s only appropriate that a major game developer like Electronic Arts would join in on the fun with an elaborate app featuring the world’s biggest sporting event. Unfortunately, though the World Cup has been on the minds of football/soccer fans for months, it seems EA rushed their development of 2010 FIFA World Cup. While sharing many similarities with the stellar FIFA 10, 2010 FIFA World Cup is in many ways an errant free kick. After the slide tackle, expect this guy to take a dive. And like so many fancy, expensive cross-promotional apps before it, FIFA World Cup’s developers went heavy on the dazzling graphics and myriad of features while overlooking the intuitiveness and playability factors essential to making an enjoyable game. Basically, the game looks great, but makes for a frustrating experience in the end. The on-screen joystick always seems like it would be a flexible and easy enough to use control scheme, but the reality is that you end up pulling it so sharply in one direction and holding down for so long that you feel as if you’re burning off your thumbprint. This is compounded by the fact that FIFA’s joystick is a little too responsive to changes in direction and the players are just small enough that you can’t always tell which direction you’re facing. But controls aren’t necessarily a reason to discredit a game altogether. For its part, EA included a fantastic assortment of gaming modes to suit every time and energy commitment a player might be willing to make at any given moment. Kick Off mode is your basic game, or “Friendly Matchup” as the game calls it. You select home and away teams, one of 10 South African stadiums, and customize your team’s formation and positions with the country’s roster. FIFA World Cup mode is the whole enchilada, where you select and customize your home team, then move through your assigned matchups for the ultimate prize. In both of these settings, you can tap around to change which player you control (indicated by a red arrow above his head), then pass to other players (with blue arrows when they’re open) until you have a clear shot at the goal. It’s a lot to get a handle on, but training mode provides unlimited practice time. Kick Off and FIFA World CUP modes provide plenty of hours of entertainment, but three more gaming options round out the field—no pun intended. Penalty Shoot-Out has you select teams and then take turns making penalty kicks. You flick the ball when it’s your turn to kick, or tap the hands button to defend the goal. Captain Your Country adds an entirely different dimension to the game. You create your own super player according to looks and country of origin (skill levels are predetermined), then play matchups where you can control only him. 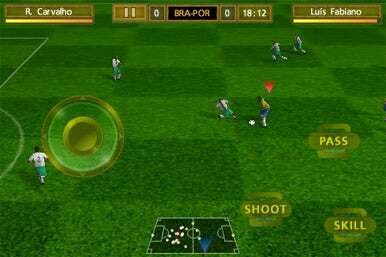 Multiplayer allows you to join or host games via Bluetooth with friends or Wi-Fi with remote players, and the settings can be adjusted for both the computer’s skill level, as well as whether you’d like the game to include music and sound effects, injuries, offsides, or commentary from a rather pleasant South African announcer. Unfortunately, despite all the bells and whistles, it takes some real fan dedication to overlook the game’s cumbersome controls. For $5, I’d expect technical features to match FIFA World Cup’s visual and conceptual successes. Unfortunately, your players handle like an awkward JV squad rather than proud members of a national team.